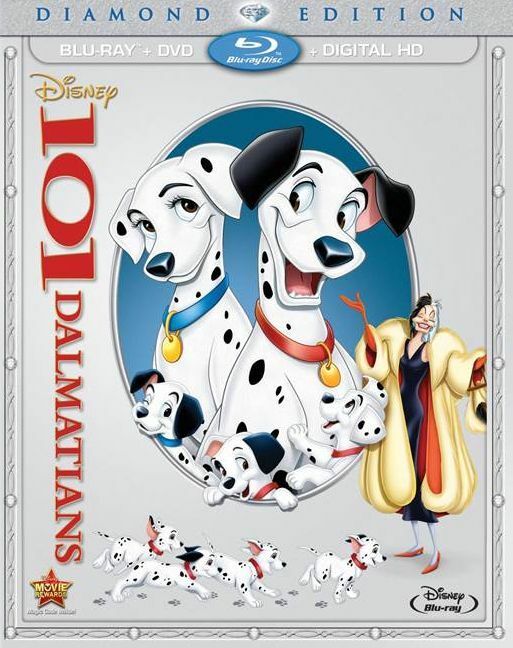 101 Dalmatians is back on on video, this time in a Diamond Edition blu-ray, DVD, Digital HD combo pack edition. Now, I've already reviewed Disney's 101 Dalmatians, so there isn't much need to cover the story or my thoughts on it when you could just go read that. So instead I'll just focus on the blu-ray features. First, it looks fantastic. For such an old movie they have really cleaned it up well. There is like no grain whatsoever and it looks like could have been made this year, well except that it uses traditional hand-drawn art and not computers which all animated movies seem to use nowadays. The sound is also great, with a 7.1 surround track. We only have a 5.1 system set up so we couldn't take full advantage of it, but 5.1 sounds great as well. There is also a mono track if you want to hear what it sounded like originally without the multi-channel upgrade. Lucky Dogs -- Conversations With the Disney Team! DisneyView -- Expand Your Viewing Experience! That's quite a bit of extras, over two hours in fact. Lucky Dogs is an interesting one where people who worked on the film reminisce about their experiences, and what makes it interesting is the challenges especially since they were cutting costs and laying people off at that time. The Further Adventures of Thunderbolt is a short animated film, about two minutes, about the character Thunderbolt that the dalmatians in the movie like to watch. The Best Doggoned Dog in the World is one of the longer extra features, clocking in at a little under an hour, and is actually an episode of The Wonderful World of Disney. And it's in high-definition, which is amazing! The Making-of and the Music & More content are also enjoyable. The Music section shows deleted songs and some demo recordings. So there's really a lot here to watch after the movie is over. This is an enjoyable film packaged in another good Diamond Edition release and is worth getting if you're a fan of the Dalmatians.